I promise, you will be hooked to this super cool lemon clay mask. Not only is it super cool, but it’s got a wonderful oh so cooling sensation. All of our clay mask recipes leave your skin feeling so cleansed and smooth afterwards. But this is the only recipe that leaves your skin feeling cooled. This mask is filled with energizing lemon and cooling peppermint then infused with acne fighting bentonite. And it’s packed with minerals, vitamin c and omega fatty acids. Most clay masks are amazing for oily and combination skin. Those with sensitive skin or dry skin should only apply a clay mask to their skin for half the recommended time. 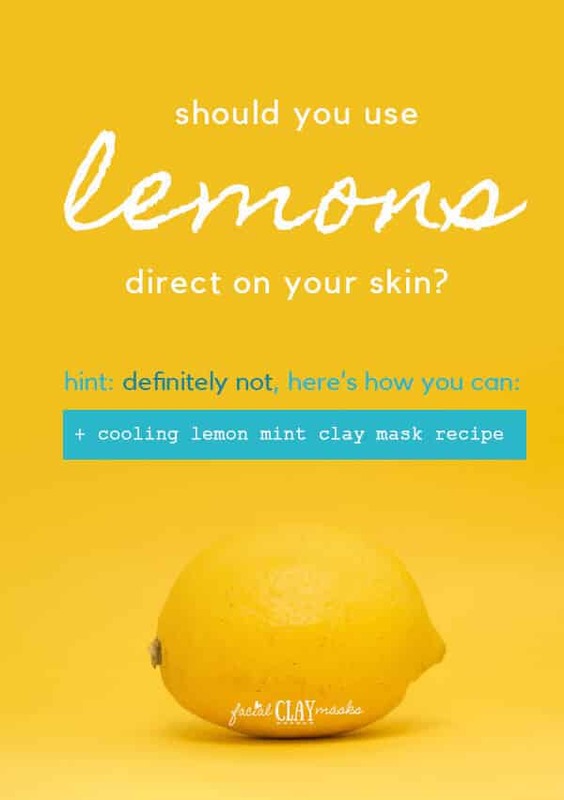 This lemon clay mask recipe however is a very balanced recipe and is good for all skin types. It is even a bit moisturizing. With the crisp minty scent and the cooling sensation this is a perfect summer recipe. However what I don’t like is the list of ingredients. It not just one or two that you can’t pronounce, check out the ingredient list on this puppy. Phenoxyethanol is an antibacterial in cosmetics and according to orgaid it’s one of the top 10 ingredients in your cosmetics to avoid. If absorbed into your skin, it can have an effect on your brain and central nervous system. My understanding is some companies use this in small amounts which might not be harmful to the skin, but overtime could accumulate. Propylparaben is part of the paraben family and can mimic estrogen in your body. Hormones can be a leading cause of why you get acne in the first place. But that’s ok! Because this recipe is equally just as affordable per mask and made of all natural ingredients. You will notice from the above list of ingredients there was Bentonite Clay and Kaolin Clay. For simplicity we decided to only go with Bentonite, but you don’t have to choose just one if you get our facial clay assortment pack. 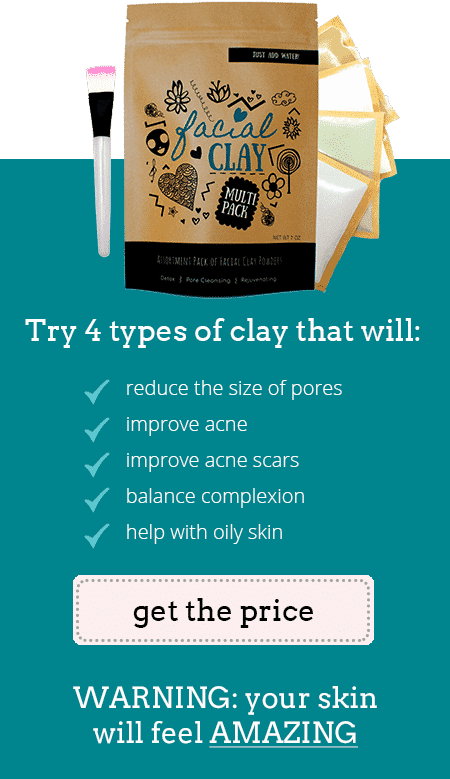 Each pack comes with 4 of the best types of clay! What are the benefits of lemon for your skin? What are the benefits of Peppermint for your face? What are the lemon clay mask ingredients? Before we dive into the clay mask recipe there’s a couple important items to go over first. First let’s cover the benefits of lemon. As great as those benefits are, there is definitely a wrong way to use lemon in your skincare. We will go over the right way to use lemon on your skin. In curating this recipe, I tried a couple different methods. The first method was way too cooling, so I’ll show you the proper way to use peppermint for your skin. Lemons are a surprising amount of vitamin C. Lemons contain 64% of your daily vitamin C per 100 grams, compared to an orange which contains 88%. Albeit, oranges are a bunch more enjoyable to eat! Vitamin C is the foundation for my daily skincare, starting with a vitamin c daily cleanser and vitamin c serum. After incorporating vitamin C serum into my routine, I noticed an improved change to brightening my skin tone. This study about vitamin C indicates that vitamin C can promote collagen production and lightening hyperpigmentation. Other than Vitamin C, lemons are not a significant source of other vitamins. They do contain polyphenols, terpenes and tannins. Mr. Facial Clay Masks often calls me a “sun baby”. I LOVE the sun, but I know how bad it is for my skin. It has caused sun spots and aging. I call them my sun wrinkles. Since the first sun wrinkle appeared, I’ve been on a tangent to reduce the depth and appearance of sun damage. Polyphenols found in lemons, have a promising approach to remedying skin aging and UV damage. It’s because of those polyphenols that lemons are said to aid with sun spots. BUT do not continue with lemons as a skincare treatment before reading this. There are many articles that I encountered that promoted using lemons in all the wrong way. A lot of articles recommended applying lemon juice directly to your face. Do not apply lemon direct to your skin. Why should you not apply lemon direct to your skin? Science. 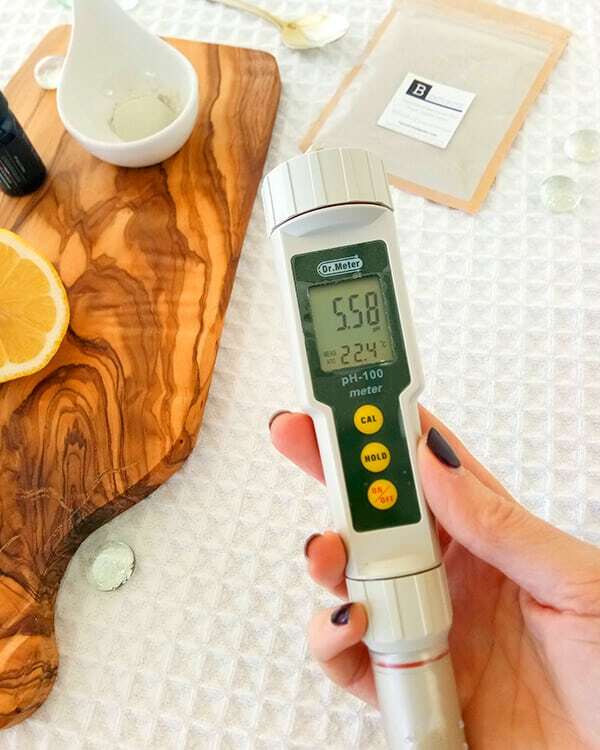 You’ll notice with all our recipe formulations, we test the PH of each recipe. That’s because the PH of your skin is so important to healthy skin without skin conditions. Too low of PH skin will result in oily skin, which normally means more acne. Too high of PH skin will result in dry skin. Ideally, our skin should be at a 5.5 PH. What is the PH of lemons? Lemons have a PH of 2.2. This means it’s VERY acidic. We often use apple cider vinegar in our clay mask recipes because of it’s acidity, and it’s normally a 3.5 PH. So lemons are even more acidic than apple cider vinegar. 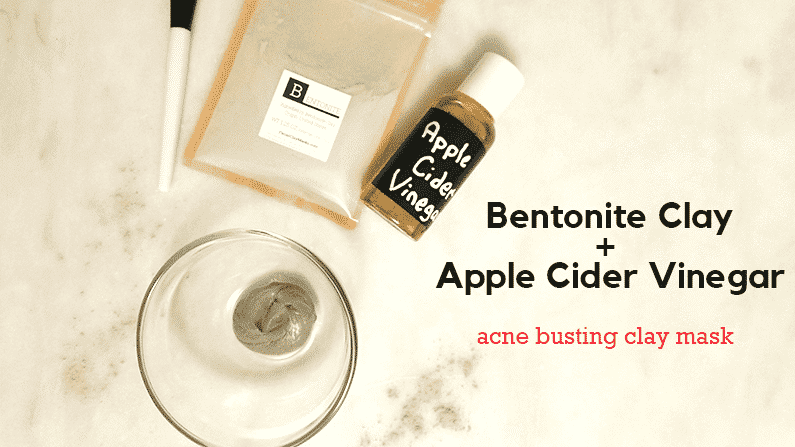 Try out apple cider vinegar and bentonite clay recipe. You could damage the natural acid mantle of your skin if you apply ingredients to your face that are too different of a PH than your skin’s natural PH level of 5.5. The acid mantle of your skin protects your skin from harmful bacteria. 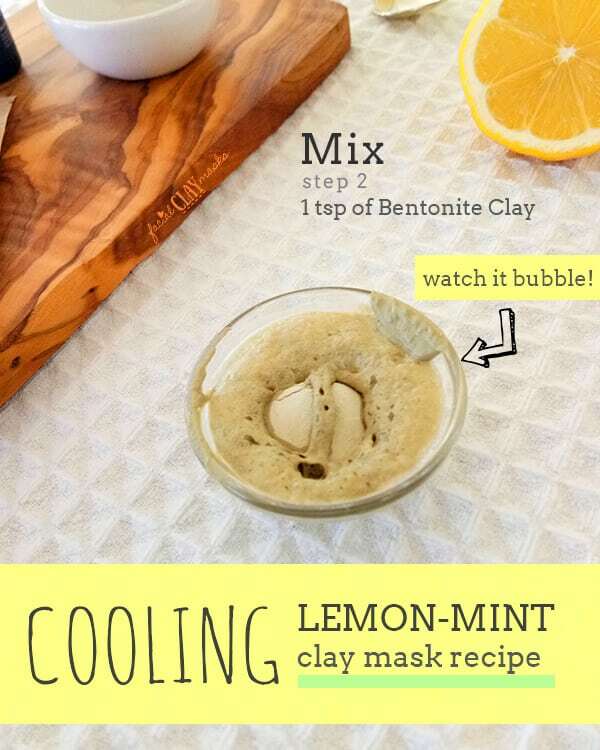 Bentonite clay has a PH of approx 8.7 to 9, so it’s a perfect combination to mix lemon with bentonite. Our PH meter gave this lemon clay mask recipe a 5.5 PH. That makes this face mask a perfect fit for all skin types! What are the benefits of Bentonite Clay for your skin? Bentonite clay, is made of aged volcanic ash, that is mined from many meters below the earth’s surface. The hydrated clay is then dried and milled to a fine powder. When it’s reunited with liquid, the negatively charged clay releases the plethora of minerals stuck to it’s surface creating a mineral rich paste. Bentonite clay also works to remove impurities like toxins, heavy metals, and chemicals from your skin by absorbing them. That’s the intro version to the science of how clay works for your skin. But what does that mean for your skin? Super cleanse your skin. Skin that has clogged pores or excess dirt can lead to acne and blemishes. Getting a deep clean of your skin 1 to 2 times a week is a pretty important part of your skin care routine. Detoxify by absorbing heavy metals, chemicals, and toxins from your skin. You might think this doesn’t apply but just think about what is in the makeup that you apply to your skin everyday. Or the heavy metals in the traffic pollution. Help with oily skin. Bentonite clay is a swelling clay. That means it can swell up to 18 times it’s size. And when drying it also de-swells. I’m making up my own word for that 😛 This absorbs excess oils from the skin which can help with ongoing sebum production. Fight and improve acne. Less dirt in your pores, less excessive oil, and less impurities on your skin all equal less acne. It also does a pretty great job to decrease existing acne or stop blemishes in their tracks. Stopping blemishes is not proven, but from my experience it will definitely put those acne breakouts on a fast pace and could even be gone by the next morning. What are the benefits of peppermint for your skin? Our minty freshness of this lemon mint face mask comes from our favorite, peppermint essential oil! You could also use spearmint if you don’t have peppermint. Like a lot of essential oils tested in this study, peppermint was one of 4 essential oils effective against all 22 bacteria strains tested. And even effective against 91% of fungi growth. I pray that is never a problem I ever have to think about for my skin. Any essential oil that is antibacterial is great to incorporate into your skincare. Thoroughly cleansed skin reduces the opportunity for clogged pores and acne. I love that there is a TON of information at my fingertips by a simple google search. I can easily learn about what essential oils are good for me skin and which are not. However there is also a TON of wrong information available. The biggest mistake most people make with using essential oils is not mixing it with a proper dispersant. Essential oils are hydrophobic and cannot blend in water. If you add a drop of essential oils to water, it will simply sit on the surface. If you were to cleanse your skin with the water and essential oil, it would be the equivalent of putting the essential oil direct onto your skin. You never want to do this. Essential oils are super concentrated and cause chemical sensitivities if applied undiluted to your skin. This is why most recipes or advice you find tells you to mix essential oils with a carrier oil. You can only mix water with an essential oil when it’s combined with an emulsifying agent. An emulsifier, like alcohol or castile soap, mixes water and an essential oil together. 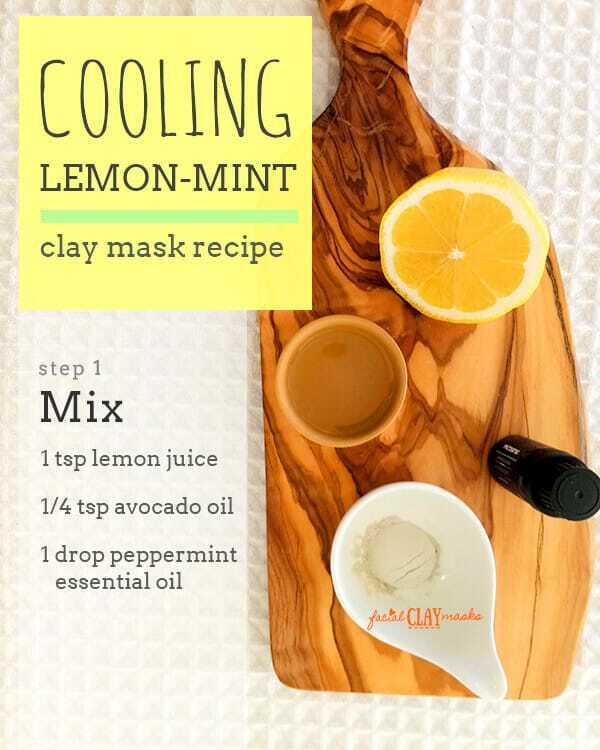 We incorporated a bit of avocado oil into our lemon mint clay face mask to blend the essential oils with. I learned about this above because I mixed the lemon with peppermint essential oil and didn’t think the emulsifier rules above applied since it’s not a water. Not true, the mask was super cooling, too much. The essential oil didn’t mix with the lemon and was the equivalent applying peppermint direct to my skin. 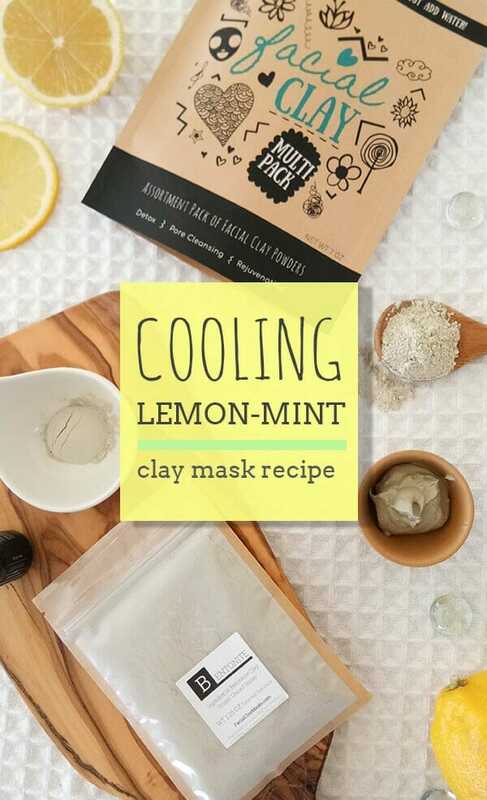 The ingredients for this cooling lemon mint clay mask are pretty simple. Where to buy your Bentonite Clay? Bentonite is one of the 4 types of clay that are included in our facial clay assortment pack. Our Bentonite Clay is mined from the Death Valley Desert region. It’s sun dried and milled to a very fine 325 mesh powder. Most types of bentonite are generally around 50-70 mesh. In other words, it’s very fine and mixes beautifully. If you do purchase our clay multi pack, we know you will love it! 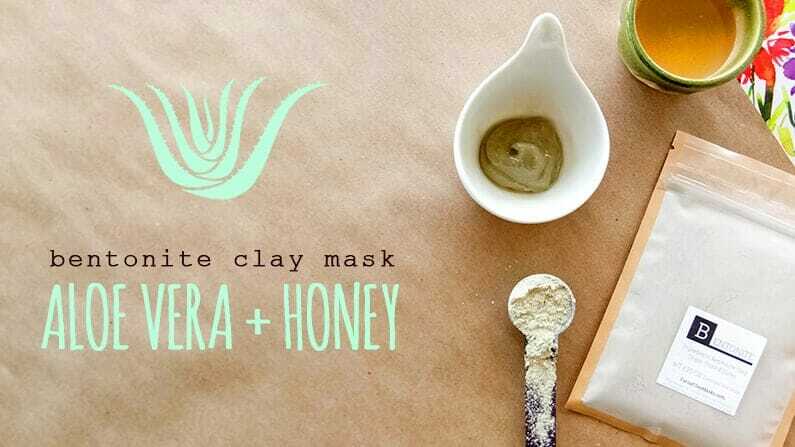 We thank you, it’s how we can offer you ad-free, free clay mask recipes like this one. We package these clays in North America, click here to get yours on Amazon. This recipe yields 1 face mask recipes. I would mix this mask and apply right away. Step 1: Mix the 1 tsp of lemon juice, 1/4 teaspoon of avocado oil, and 1 drop of peppermint essential oil. Step 2: Add bentonite clay and mix. When mixing bentonite with lemon or apple cider vinegar, you will get a bubble reaction. It’s a lot cleaner if you use a face mask brush to apply the mask. Apply a liberal, thin layer to your skin. This mask dried way faster than other clay mask recipes. I found you needed to leave on your skin for only 5 minutes before it was time to take it off. How do you know when to take off a clay mask? Rinse off BEFORE the clay mask dries. Leaving it on until it gets all cracked and dry can remove natural oils from your skin. I did this mask twice in one week, once the wrong way and the second the correct way. Along with this mask applied twice, I also mix an aloe vera gel and vitamin e serum overnight mask. The combination of the 2 fast tracked a breakout I was having to almost fully cleared in 3 days. Woot!